Here to challenge the latest Toyota Camry and Honda Accord is the new 2019 Nissan Altima, which Nissan says will shake up the midsize sedan segment when it goes on sale in the United States in autumn. Like the previous model, it will be offered globally as well, likely retaining the Teana name in some markets. Previewed by the Vmotion 2.0 Concept in Detroit earlier this year, the Altima boasts a far sportier and more dynamic design even compared to its sleek predecessor. A bold full-height V-motion grille dominates the front end, accompanied by slim arrow-shaped headlights optionally available with LED technology. Lower-profile engines enabled the designers to push for a lower bonnet and cowl. The bodyside features a prominent shoulder line that spans from the headlights to the tail lights, as well as a twisting shoulder and sharp character lines lower down. The floating roof design provided by the black C-pillars add to the more coupé-like look, while the rear features boomerang-shaped tail lights and plenty of horizontal lines to provide an impression of width. Wheel sizes range up to a massive 19 inches in diameter. Compared to the previous Altima, the new car is 25 mm longer, 23 mm wider and 28 mm lower, while the wheelbase has grown by a massive 48 mm – this makes for a shorter front overhang and allows for the rear wheels to be pushed further into the corners. The interior features a more horizontal “gliding wing” dashboard design, along with high-contrast colours and trim materials that Nissan says provides a near-premium feel. The Zero Gravity seats from the outgoing model have been enhanced with dual-density foam and extra bolstering for improved support and are available with perforated leather upholstery and eight-way power adjustment. 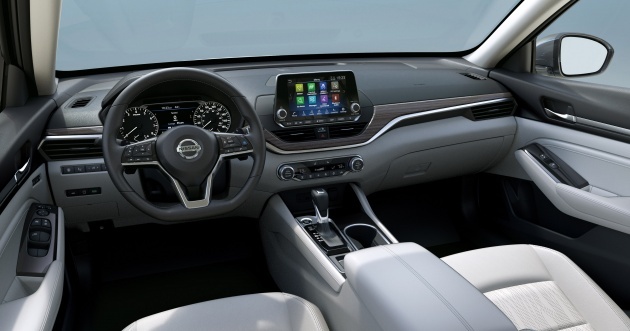 As standard, the new Altima features the NissanConnectSM infotainment system with an eight-inch multi-touch display, Apple CarPlay, Android Auto, Siri and Google Assistant voice recognition as well as compatibility with the Amazon Alexa personal assistant. NissanConnect Navigation and Services incorporating over-the-air updates, door-to-door navigation and real-time traffic is available as an option, as is Apple Watch and Android Wear smartwatch functionality through the NissanConnect Services app. The latter provides features such as remote engine start and remote lock valet alert, among others. Other options include remote engine start with Intelligent Climate Control, a moonroof, a Bose Premium Audio system with eight speakers and noise cancellation. A seven-inch Advanced Drive Assist Display in the instrument cluster is fitted as standard. 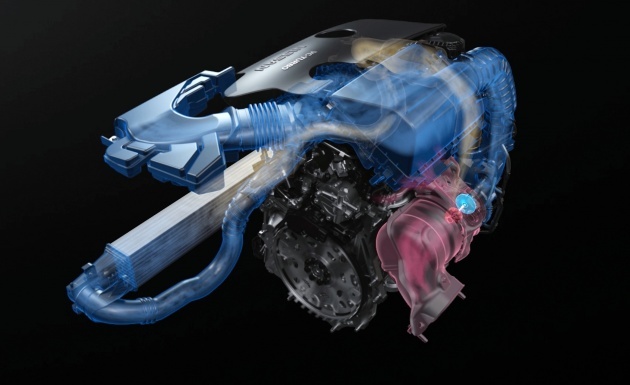 Under the bonnet lies the world’s first variable compression engine – the 2.0 litre VC Turbo direct-injected four-cylinder that first made its debut on the Infiniti QX50. Replacing the old 3.5 litre naturally-aspirated V6, the new engine uses an electrically-powered actuator arm to switch between a 8:1 compression ratio for high performance and an 14:1 ratio for better fuel economy. The result is 248 hp and 370 Nm of torque, along with a significant expected improvement in fuel consumption, emissions and noise, vibration and harshness. The standard 2.5 litre naturally-aspirated four-pot has also been improved with direct injection, electronic variable valve timing (e-VTC) and cooled exhaust gas recirculation (EGR) to produce 188 hp and 244 Nm. An Xtronic CVT with expanded lock-up is fitted as standard and is available with paddle shifters. New for this year is an optional part-time Intelligent All-Wheel Drive system that sends up to 50% of torque to the rear wheels. The improved chassis features new monotube rear dampers, added suspension reinforcements, retuned suspension geometry, dual-pinion electric power steering and a new Integrated Dynamics Module (IDM) incorporating Intelligent Ride Control, Intelligent Trace Control and Vehicle Dynamics Control. Safety-wise, the Altima is now available with ProPILOT Assist single-lane semi-autonomous highway driving that assists in acceleration, braking and steering, along with Traffic Sign Recognition. Automatic Emergency Braking, Intelligent Forward Collision Warning (I-FCW) and Intelligent Driver Alertness (I-DA) is offered as standard across the range, while an Intelligent Around View Monitor (I-AVM) is optional. Also available is the new Nissan Safety Shield 360 package that features the new Rear Automatic Braking (RR-AB), along with Automatic Emergency Braking with Pedestrian Detection, Lane Departure Warning (LDW), Blind Spot Warning (BSW), Rear Cross Traffic Alert (RCTA) and High Beam Assist (HBA). The all-new Altima takes its inspiration from the award-winning Nissan Vmotion 2.0 concept, which debuted at the 2017 North American International Auto Show in Detroit. Like the show car, the production Altima attracts immediate attention with its athletic stance and proportions – lower, wider and more dynamic than previous generations, thanks in part to new platform packaging and the use of two new low-profile engine designs. In the US, Nissan Maxima is the model that compares to the Accord and Camry, while the Altima challenges the Civic and Corolla. Nissan USA has the Sentra (badged as the Sylphy here in Malaysia) that goes against the Civic and Corolla. The Altima is the Accord/Camry rival. The Maxima is one size bigger, going against the Toyota Avalon (Lexus ES size here for reference). Nissan maxima compared to honda legend, hyundai azera & kia cadenza which is only 3.5L V6 engine available. Ekceli i used to pick our Perdana V6 over the Nissan cefiro. Best family car that i owned. Pity MITI does not allow The Toyota Avalon and the Nissan Maxima into Malaysia. ETCM and UMW have tried but MITI refuses to give approval. Of course, they have to protect BMW 7 series and Audi A8 Both GLC owned. Really? So u never heard of Infiniti & Lexus b4 huh? If they allowed to bring into malaysia the road tax and excise duty will be super high. Cause that cars only 3.5L V6 available. Actually Maxima is not even in the category of Avalon. Avalon is in the market of large sedan while Maxima is sport sedan. Maxima competes with Mark X.
Don’t get your hopes up. ETCM is run by dinasours. Their product planners are still in a coma. The specifications of their cars are done by someone senile. Do you even see any new Sylphy on the roads? ; they gave up selling it. They have yet to turn on their PC running Windows 95 and launch Netscape to discover X-Trail and Teana already facelifted from years ago. We all basically gave up any hope on ETCM a long time ago. That’s why, with the increasing emergence & presence of Mazda cars, Nissan might lose the top three spot..
Nice car. To bad wont make it in msia. handsome car…if priced right here, will be a good alternative to accord and camry. waaaa….nice design, nice engine, nice safety features…bring this to Malaysia fast, but make sure to price it well my dear nissan malaysia, and if u do, this will spearhead your overall sales.. Finally a decent looking Nissan. I’m curious why Nissan did not sell facelift Teana in our region? At least the facelift is looking good compare the current face. BTW, I hope Tan Chong will sell this new Teana by next year to Malaysia. Because its ETCM we are talking about here, that’s why. US market Maxima still looks better inside out.. Finally, a more dynamic & tech-driven Nissan saloon has arrived after years of ultra-conservatism. This model should be challenging for the top spot for the local mainstream D-Segment. Provided Tan Chong maintained all the technical gizmos. What a gorgeous car.. Looks better than the new Accord and Camry, imo.. I love the simplicity of the interior too but I totally hate the floating screen.. Shake up the midsize sedan segment?? Shaking my head lol. Design is nice but the new Accord & Camry are way nicer. Cant even compete with current Mazda 6 design. Anyone else think the upcoming Camry design looks abit like the old US Camry (2nd previous gen) especially the front? they only changed the grill the front lights is identical. The Teana is not in demand today in Msia. Lost its appeal. People lose interest in it quickly. But Camry and Accord still in demand . maybe if Nissan kept the name Sei Fei Lou instead of Auntie name Teana? I think Nissan should call the same name across the globe for this model, not like in Malaysia called Teana but in USA called Altima! Next Post: GALLERY: GPX Racing Demon 150GR, 150GN and Gentleman 200 – in Malaysia soon from RM8k-RM11k?